… Or a lot more times. It was the end of daylight and the clouds were gathering. 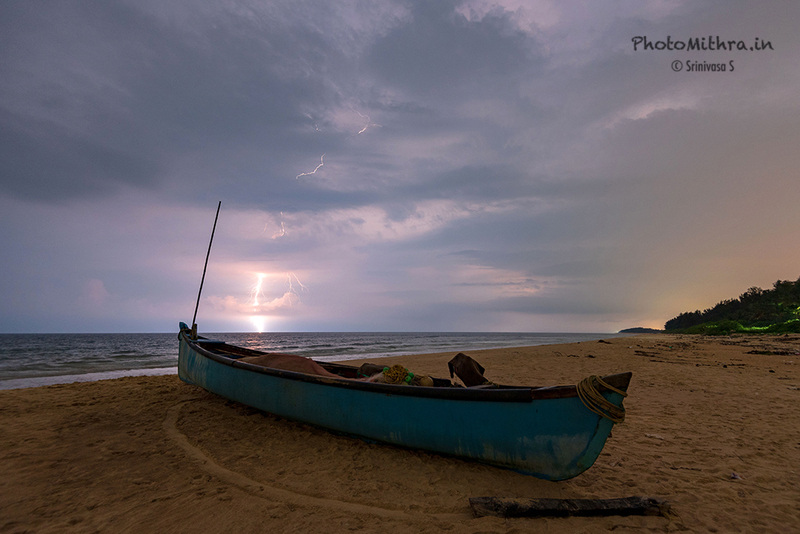 We were at a beach in coastal Karnataka, slightly disappointed with the light conditions and the location itself. I had packed up and was ready to leave. Out of the 4 of us, 2 were already waiting in the car. Pratap was in no mood to leave just yet – he was shooting a timelapse and there was a good 15 minutes or so left. He cajoled me to use the time to keep shooting as well. It was dark, the rain would start any moment. At a distance we could see flashes of lightning every now and then. I just put my camera up on the tripod. With the scene so dark, I had to burn through a few shots to get the focus sharp and composition to my liking. After this, I was just triggering my camera with the remote one shot after another. They were all about 20s exposures, and my hope was to get one good shot with a lightning bolt. Having captured about 40 shots, and scampering to the car as the rains opened up, the one decent shot I managed is this! I’m not totally happy about it, but not overly disappointed either. As I mentioned in my previous post, its important to get out there, stay out as long as possible and keep shooting.